Unlock your Lenovo in three easy steps fast and simple. Legally unlock without voiding the warranty. 100% online; no need to leave your phone at a local store. Valid for all Lenovo phone models. How to unlock my Lenovo phone with doctorSIM? Submit your unlocking request by selecting the country and the network carrier to which your Lenovo phone is locked. We'll send you simple step-by-step instructions to the e-mail indicated explaining how to unlock your phone. Turn on your phone and type in the unlock code you received. Congratulations! 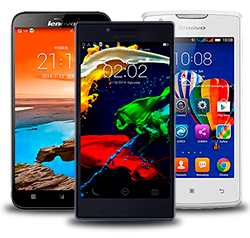 You have now unlocked your Lenovo for use on any compatible GSM carrier in the world. Is Lenovo phone unlocking 100% legal? Our method of unlocking phones by IMEI is perfectly legal. In fact, this method is the recommended one by the phone manufacturers -including Lenovo- and carrier themselves as it won't damage the phone or void the warranty. How do I submit my Lenovo phone unlock request? First, to check availability you need to know the country and network to which your phone is locked. If your Lenovo phone can be unlocked using one of our unlocking services, complete the remaining fields including your phone's IMEI number and then select your preferred method of payment to submit your request: PayPal, credit or debit card, Apple Pay, Bitcoin among other cryptocurrencies, etc. Will my Lenovo smartphone be unlocked permanently? Yes. Cell phone unlocking with doctorSIM is a one-time procedure. Your Lenovo will not lock again to any carrier even if you restore it to factory settings or download official software updates in the future. How do you unlock a Lenovo phone? To unlock a Lenovo, first access the phone by typing your PIN. Then insert a SIM card which is from a network carrier different to the one the phone is locked to and type the unlock code. The unlock code will be sent to your e-mail by doctorSIM and will allow you to use your Lenovo device on any compatible carrier in the world. For how long does the unlocking last? doctorSIM's unlock method via IMEI is permanent. The phone will never relock even if you restore your Lenovo to factory settings. In the extremely rare case that the phone prompts for the unlock code again, retype it as the code never expires. How many unlocking attempts does my Lenovo phone have? You have an unlimited amount of attempts to unlock your Lenovo phone as this make doesn't have this particular restriction. Nonetheless, the unlock code you'll receive from doctorSIM will work the first time. We believe in total transparency at doctorSIM and will not charge you additional fees after you've hit the submit button. The price indicated once you have selected the country and network provider is the final price. Prior to submitting your request, read the descriptions carefully to make sure you select the correct unlocking service for your particular Lenovo phone. You will be able to use your Lenovo with any carrier in the world. Your Lenovo's warranty will remain intact. Continue to use your phone while we process your request. Permanently unlock your phone from wherever you are. Fast turnaround (within minutes to a few business days). Simple step-by-step instructions delivered 24 hours a day, 7 days a week. Customer support available via telephone, e-mail, and chat.